It looks there won't be a long wait for a Jessica Rabbit Christmas ornament after all. 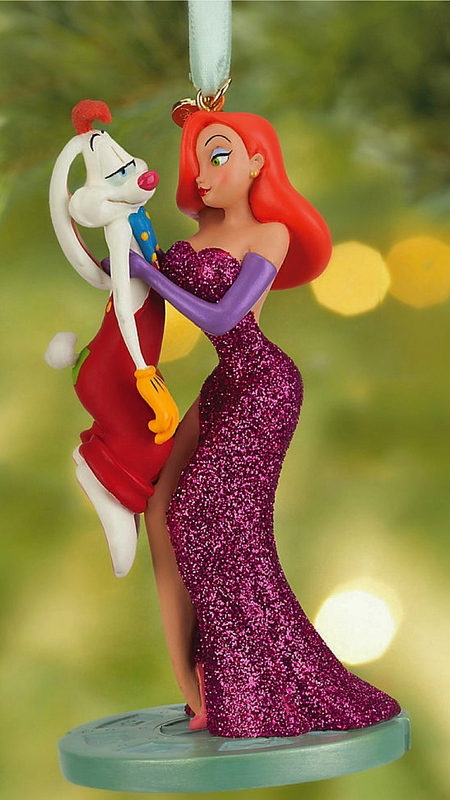 Summer is barely over and it's already starting to look a lot like Christmas with this brand new Roger and Jessica Rabbit Sketchbook Ornament from the Disney Store. 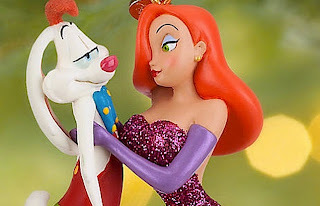 This is a Fully sculptured figural ornament featuring Jessica holding her hubby, Roger. Jessica's dress is a fully glittered gown. One great aspect to this ornament is that it is freestanding for tree or desk display. There is a gold 2013 Disney Store logo charm at the top hook and it stands at 4 1/4'' tall. The ornament is inspired by Disney Store artist sketchbooks and, even better, sells for only $12.95 each. Head on over to the Disney Store to Order Now. Toontown Treat: Why don't 'cha do right by the holidays and ''p-p-please'' hang this sparkling Roger and Jessica ornament on your family tree, animating the festivities with colorful cartoon capers all season long.